Gone are the days when concrete appeared raw and unappealing. Thanks to new designs and casting methods, the utilitarian and sturdy aspects of concrete are subtly being incorporated with elegance and style. The usage of concrete also brings with it some benefits to home owners that lends to its growing applicability. In the past, concrete has been used extensively in outdoor open spaces; owing to its practical nature and former applications such as in patios and drivewaysDriveways / Patios / Sidewalks, its possibilities as a design element seem limited. However, concrete is anything but boring and uninspiring. It is a versatile material that can be cast into various customizable designs and its greatest benefit is seen in its ability to take on any shape and form. With a little out-of-the-box thinking, many skillful uses of concrete can be found to create alternatives for costly installations. Concrete works particularly well when used in flooring or wall panels due to its sturdy and long lasting nature. While its cool neutral gray hues elevate the faux industrial look in communal spaces, it serves as the ideal material when bringing a sleek minimalist touch to modern homes. Thanks to its heat and scratch resistant characteristics, it poses as the most apt material for kitchen islands, in-built sinks, and countertops. Concrete’s utility has also invaded the production of bathroom dividers and backsplashes as these structures surge and enjoy their moment. Additionally, the water and stain resistant quality of concrete-seals makes it suitable for use in wet spaces. As stone veneers see their way out, concrete enhances the minimalist tone, which adds to its sudden resurgence. When used for fireplaces or as art installations, concrete provides a cohesive wholesomeness, unmatched by other surfaces. Its flexible use makes it ideal for the construction of textured designs on walls, and art pieces. Recent shifts in the design community have led to the development of concrete suspension light fixtures. The simple design brings a striking contrast to the heavy tone set by the concrete mold. The amalgamation of these two stark concepts brings an unexpected turn in the multifarious world of concrete’s ever expansive reach. 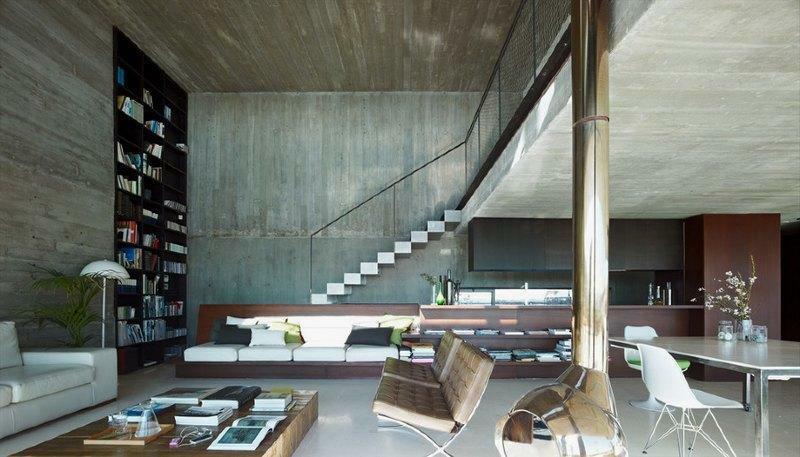 Owing to its adaptable and versatile nature, the use of concrete in indoor spaces is ingenious. The ever evolving landscape of technology allows for the development of new mixes that come in a variety of finishes. White concrete can be stained with colors to add softness while a variety of concrete blends available in the market mimic the texture of marble and limestone post-polish, making them ideal for luxurious yet affordable interiors. Concrete is a hard-wearing and inexpensive option for home owners looking to refurbish on a budget. Due to its negligible upkeep and low installation costs, most interiors now see its integration. Concrete has plenty of defining qualities that set it apart from traditional materials. It is sturdy, and heat and water resistant. It also discourages the growth of mold and keeps out moisture. A plethora of quality seals can help make concrete scratch and stain proof as well. It is also cheaper in terms of manufacturing; and thanks to added blends and seals, it can garner the same look and feel as that of expensive materials. Much of the cost and effort required for concrete takes place prior to installation - during the purchase and application process. The longevity and durable qualities of the product help save on potential maintenance costs that would be incurred if other materials, such as wood or granite are used. These intrinsic characteristics have led to concrete making a place for itself in kitchens. Most mid-range to premium kitchen installations for countertops cost $100 to $150 per square foot. The flexibility of its surface design allows users to imitate the type of look and feel they prefer. Making it a cheaper option in comparison to luxury countertops made of granite and marble. Concrete is an unusual choice to decorate with. It is generally used for outdoor constructions such as foundations and floors, and rarely poses as an ideal for indoor decorating. However, this adds to its novelty and uniqueness. Its subtle usage, blended with design aesthetics, adds a unique architectural element to rooms. Spaces accented with concrete emanate a contemporary aesthetic that encapsulates the industrial vibe, and gives an urban feel to the space. Mixing textures and materials such as wood, leather, and dark colors; to the grainy neutral hues of concrete, softens the rigid and bare ambiance it tends to create. Available in a variety of finishes, from smooth to grainy, matte to polish, there are a variety of styles to choose from. Concrete adds texture and visuals to the room and redirects focus towards itself. Its uncommon use commands an audience and drives people to talk about it while its uses have seen its applicability in decoration choices and back-splashes on walls; and even as household items and art installations. Concrete’s ability to be manipulated and transformed into various items makes it ideal for modern living. It is a neutral medium, and yet it can be used to accent spaces with dramatic visual effects while its cost effectiveness makes it ideal for experimentation in home interiors. Although concrete may seem unnatural in a living space, it is extremely durable, with a long shelf life and is a solid addition; best suited to a busy lifestyle.